Technology is changing the future of education for the better. With the growth of tech in schools leading to improvements in collaboration, engagement and attainment. 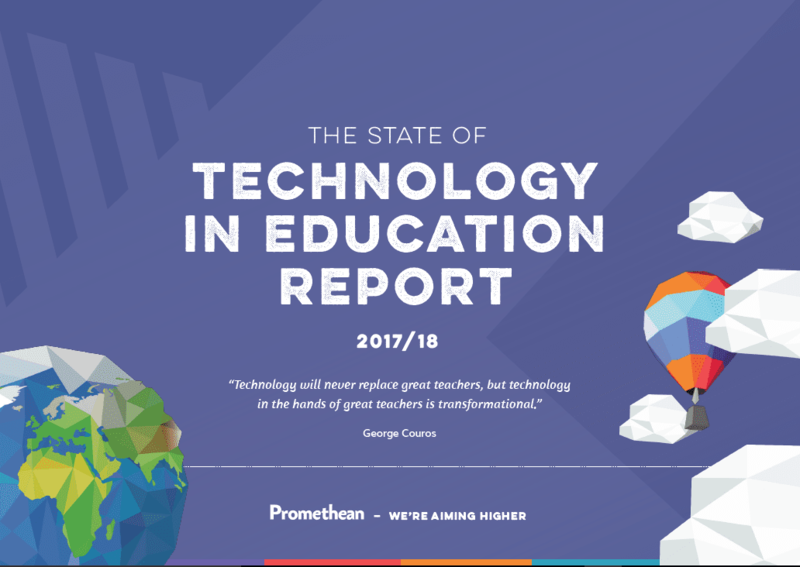 Examining current attitudes and trends shaping pedagogy in the UK, Promethean has released its annual ‘State of Technology in Education Report‘. With insights taken from over 1,600 educators, from schools across the UK, the report looks at how educational technology is being used to support both educators and students in 2018. Today, just 0.5% of teachers think that there is no place for technology in the classroom. So the use of edtech is now mainstream as we all strive to create learning experiences necessary for today’s digital world. Part of this increase in use is down to growing confidence when it comes to working with technology; with just 14% of teachers struggling to use it to the level required in education today. That’s down almost 33% from last year. Rather than simply using technology to do the same thing in a slightly different way, 51% of teachers are using IT to become more innovative. For example, educators agree that technology is an excellent way to engage students using a medium familiar to them; creating positive learning environments that add extra value and relevance to lessons. School leaders have to deal with a weighty inspection regime, changing goalposts, a recruitment crisis, and significant budgetary pressures. Technology on its own may not be the answer to these challenges, but it can help to reduce the burden. Fortunately, today’s educational leaders are acutely aware of how technology can help them meet their challenges. Even if, in some cases, IT is not yet being deployed as efficiently as it could be. While IT departments play a vital role in our technology-centred educational environment, their representation at a managerial level doesn’t always correspond. However, there are growing calls to give ICT leaders a seat at the table. In fact, many network managers see their role developing to one that reflects how IT operates in the wider corporate world; with the ability to provide valuable insights to help schools overcome their budgetary, security, regulatory, and strategic challenges. STEM classes are continuing to use technology in education more than any other subjects. This is disappointing as it means there remains a lack of understanding as to how technology can be integrated into the day-to-day classroom and make teachers’ lives easier. So, work still needs to be done when it comes to highlighting how technology can be used in schools and how – despite concerns that technology could lessen the ability of pupils to communicate face-to-face — when used correctly, it can help teachers to instill the soft-skills students need. With a backlash against policies that would see schools turn into “exam factories”, technology gives teachers the means to deliver more valuable learning experiences. Let’s face it, in a world where robots are already replacing humans, skills such as method and recall are easy to automate. However, technology is being used by innovative educators to refocus on deep learning; with an emphasis on collaboration, critical thinking, communication, character, citizenship and creativity. To find out more about how is technology supporting education in 2018, download the 2017/2018 State of Technology in Education report.